Combine all ingredients and mix in a salad bowl. To gauge amounts, start with the cilantro, onions and mango, then see how much lettuce you need to add. We used the above portions for two first-course salads. You can easily multiply this recipe and just judge as you go about much is needed for how many people you have. Whisk the juice, olive oil, shallot, soy sauce, honey, sesame oil, ginger and coriander together in a small bowl. (We ended up adding more sesame oil and soy sauce to suit our tastes, but it’s up to you.) Season to taste with salt and pepper. 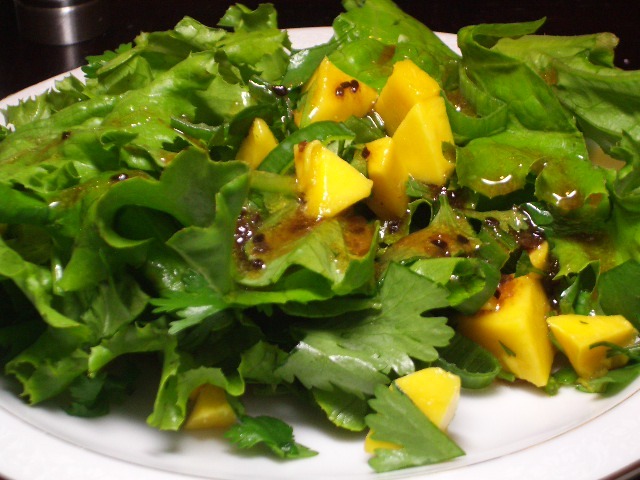 Quickly serve over the salad and ENJOY!